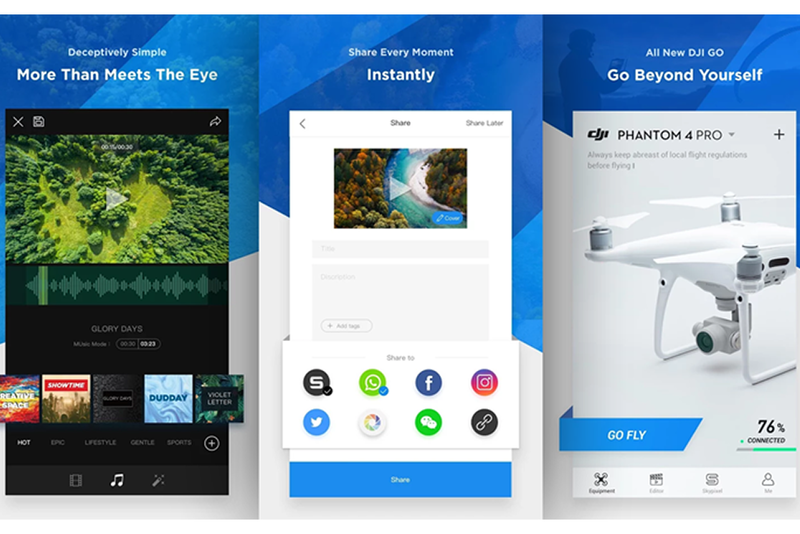 On the back of their recent drone releases, DJI has announced a new app which is compatible with the Phantom 4 Pro (and Pro+), the Inspire 2 and the Mavic Pro. The DJI GO 4 app has been released on the Google Play store for Android users and will be available by the end of 2016 for iOS device users. There are two DJI GO apps for Android right now, so it’s important that those with newer drones remember to download the GO 4. According to DJI the new app will also support their hugely popular Phantom 4 drone. 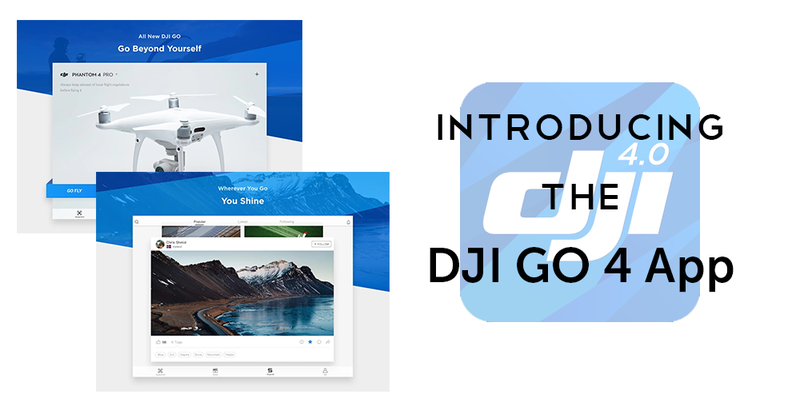 The original DJI GO app is still required for older models (apart from the Phantom 4 which is compatible), but those with newer drones will need to download the ‘new and improved’ GO 4. DJI’s new GO 4 isn’t just an update to their existing GO app functionality, it’s an entirely new app. There are plenty of similarities to the original GO app v3 when it comes to its user interface and to make matters a tad confusing even has the same icon (albeit with the addition of a small ‘4.0’. However, this isn’t just a reskin of what has come before as there are numerous new features to improve the experience for DJI drone pilots. There’s also an updated home screen with shiny new graphics. One of the most interesting new features you’ll find is what DJI are calling ‘Near Real-time Video / Image Transmission’. This allows the app’s users to receive quicker image transmission to their smartphone or tablet when using FPV mode. While it may not be fully real-time, it’s definitely an improvement. In-keeping with DJI’s statements which claim they are listening more intently to their customer base, the GO 4 app has functionality for mid-flight control of the camera, which many have been calling for. There’s also a streamlined sharing capability letting you show off your best footage to a global audience. Apart from the above new features, the DJI GO 4 app also has a better suite of video editing settings. Pilots can use videos recorded from their drone and add in a range of royalty free music and snazzy templates to it with several new songs and templates available at launch with the GO 4. Keep checking back to Heliguy’s Insider blog for more information about DJI’s releases and, of course, the latest news from the drone industry. All of the set-up steps are made easy with the PRO, RAW and Inspire 2’s collaboration with the DJI GO app. The easy-to-follow steps ensure that everything from positioning to compass calibration is a simple, rapid process. 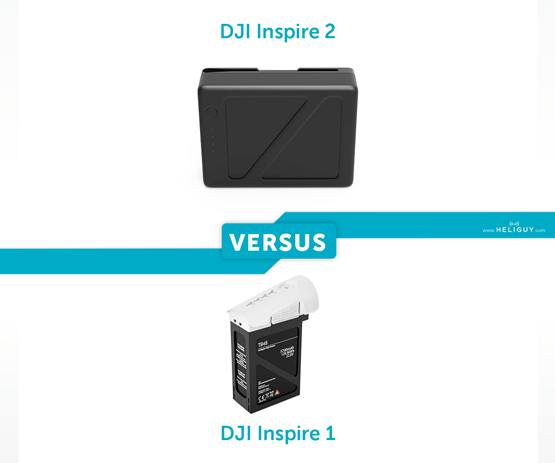 The Inspire 2 can take off if the power discrepancy of the two batteries is within 13%. If it is unable to take off due to a power discrepancy, the DJI GO app will notify you. 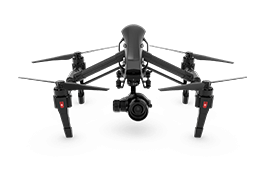 The Inspire 2 continuously checks battery status and will notify you via the DJI GO app if a battery malfunctions. If this occurs, we strongly recommend that you land the aircraft immediately. DJI’s Control / Create Event had the drone community whipped up into a frenzy. What would they unveil? Why had they chosen Warner Bros. Studio? The big money was on the Inspire 2 but before they even got around to unveiling the new iteration of their ‘workhorse’ range, they surprised everyone by revealing the Phantom 4 Professional. Building on their already impressive Phantom 4 quadcopter, the P4 Pro is packed with autonomous functionality, improved obstacle avoidance and a spectacular camera. 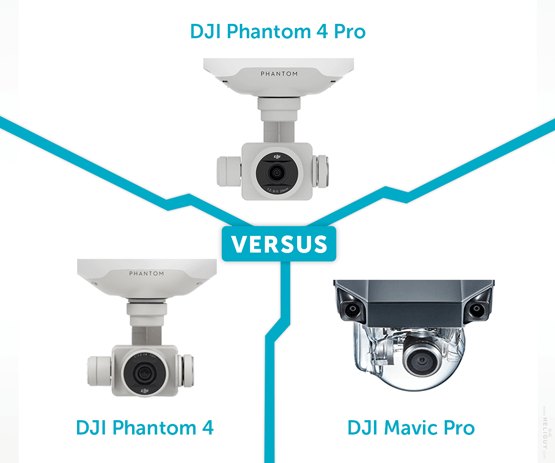 Now that we have a new entrant into DJI’s Phantom series, it’s time for another VERSUS article to see how the newcomer fares against its predecessor and also the source of much excitement (and frustration) the Mavic Pro. So scroll down to find out our results or, if you’re looking for something more specific, use the navigation menu below. As with our previous VERSUS articles, we will be comparing the following criteria: What’s Included, Camera Specs, Appearance, Performance and Battery Life. This should provide a solid overview of each model and their respective strengths as well as highlighting potential flaws. 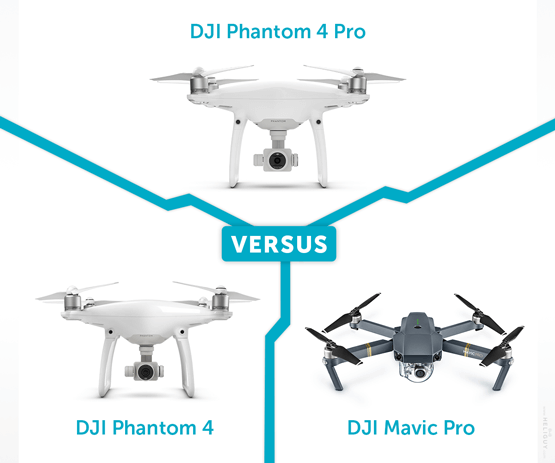 When you’re looking to invest in a quadcopter, the three names that will be filling your shopping feeds right now will be the DJI Mavic Pro, Phantom 4 and the Phantom 4 Pro. Heliguy has put together a guide allowing you to see their key features side by side which will allow you to make an informed decision. 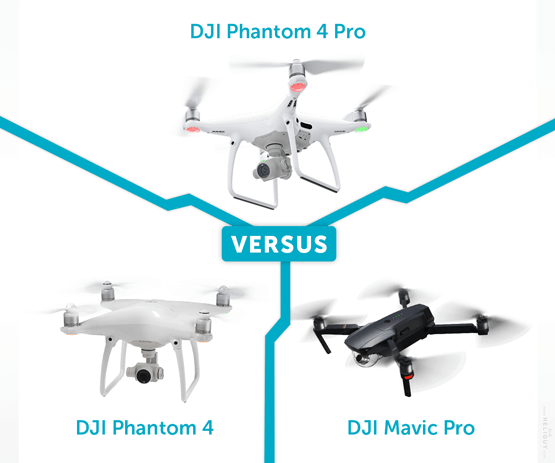 Without further ado, let’s see which of these drones comes out on top. 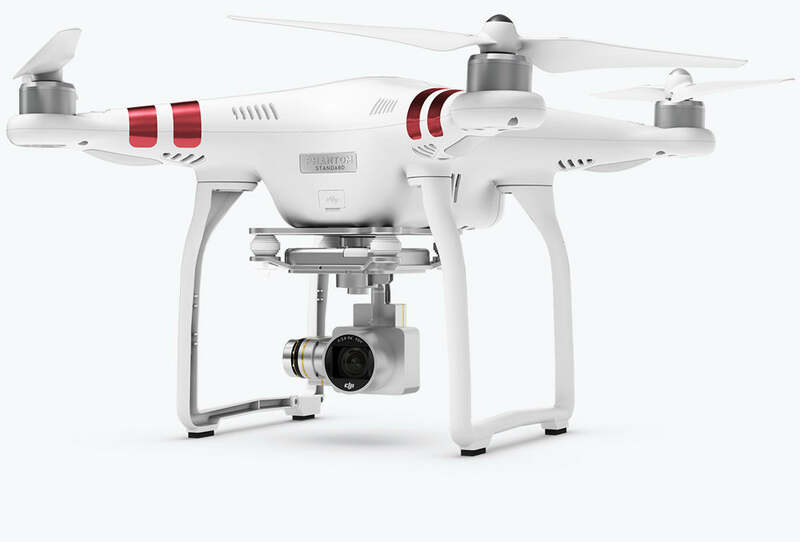 Most of our readers will be familiar with the DJI Phantom 4. It’s a sleek, well-designed quadcopter that has advanced the aesthetic of DJI’s hugely popular Phantom range. An attractive matte white body broken up by the metallic finish on the motors sits above the 4K camera which is attached to a grey undercarriage. This is all held up by a pair of sturdy legs which also contain the drone’s intelligent collision avoidance sensors. The Phantom 4 Pro doesn’t fix what isn’t broken and retains a similar aesthetic to the original Phantom 4. 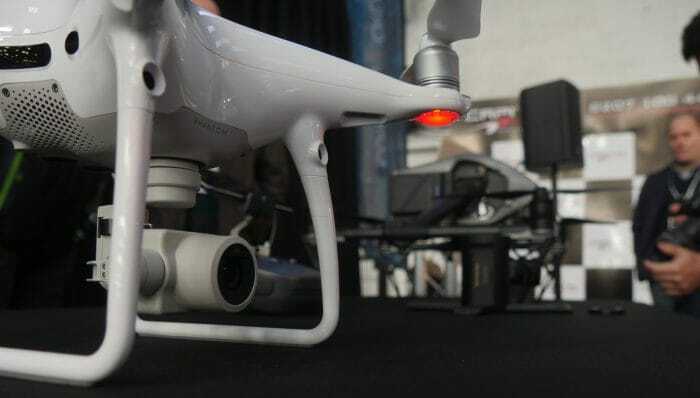 The main differences you’ll notice are a redesigned integrated 3-axis gimbal and the addition of obstacle avoidance sensors on the side and back of the aircraft pitched by DJI as Five-Direction Optical Sensing. The main change in design comes with the Phantom 4 Pro+ which features an all new remote controller with an integrated 1000nit tablet optimised for use with the DJI GO app. Then there’s the DJI Mavic Pro, featuring a showstopping new design incorporating innovative folding functionality. As is to be expected, this new release continues the trend of DJI learning from their previous models and the Mavic also benefits from the solid construction & high-quality materials synonymous with the Shenzhen brand. There’s also a new intuitive and ergonomically enhanced controller with dual display ensuring fewer distractions on your device’s camera view. All sharp lines and metallic grey, you can tell the Mavic is superbly aerodynamic before you’re even seen it in the air. When it’s folded away, you’ll be left wondering how DJI have managed to pack in all the functionality, with videos online showing people literally putting it in their pocket. There’s also the camera and the optional clear housing which offers some protection for the lens and 3-axis gimbal when in transit or adverse conditions, rounding off the attractive aesthetics. The Phantom 4 is the result of years of R&D from DJI, creating the smartest quadcopter currently available. 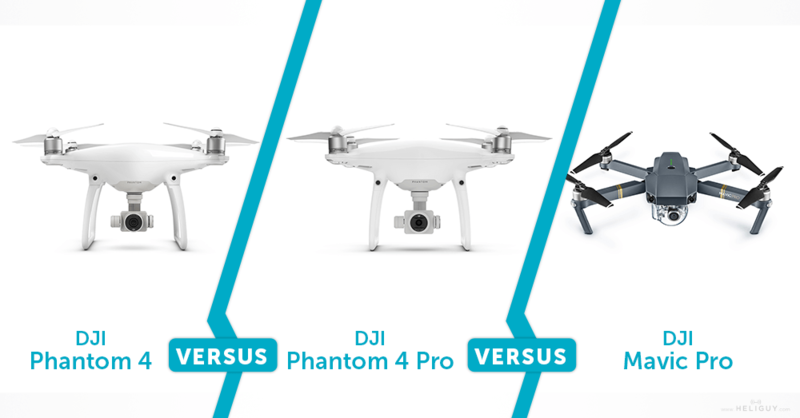 With a huge range of features including ActiveTrack (which enables it to intelligently follow moving subjects) and TapFly (which allows one touch take-off and landing, all while benefitting from DJI’s obstacle avoidance) the Phantom 4 offers undeniable variety and quality. There are also flight features such as ‘Sport Mode’ which allows the P4 to reach speeds of up to 45mph. 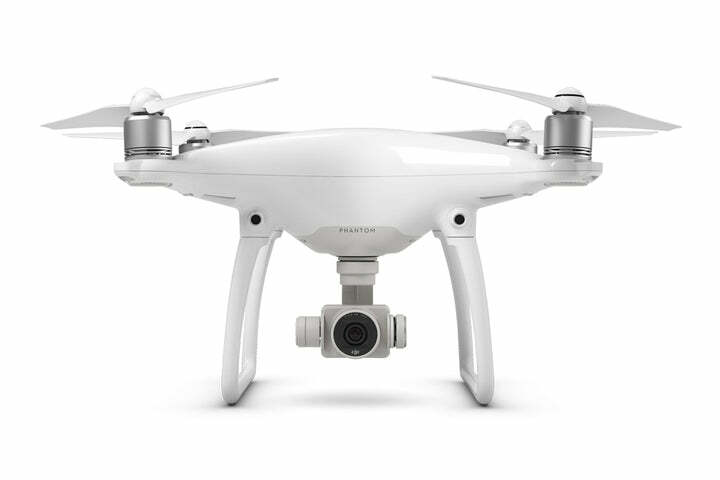 With an impressive array of functionality including the ability to intelligently avoid obstacles as well as being exceptionally easy to use, the Phantom 4 is a very high-quality quadcopter which is also becoming increasingly affordable. However, flying ahead of even the Phantom 4 is the Mavic Pro which contains much of the same functionality as the P4 such as ActiveTrack and TapFly, as well as new features like TerrainFollow in a smaller, more portable package. 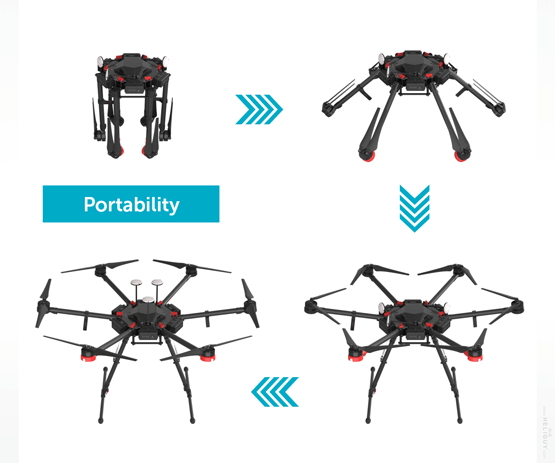 The fact that the arms fold flush into the drone’s body thanks to some brilliant engineering from DJI ensures that it’s impressively small and easy to transport. 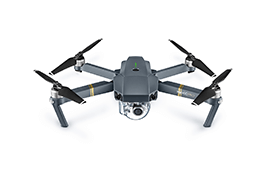 The Mavic Pro also comes with a Sports Mode allowing it to reach speeds of up to 40mph in optimal conditions. This speedy feature has been advertised alongside a new product ‘DJI Goggles’ which allow for a VR FPV drone flying experience, evidence of DJI edging towards the racing market. As for ease of use, the Mavic is already being called one of the simplest drones to get to grips with. While there is plenty of depth available for seasoned flyers looking for an easily portable aerial camera, it’s also ideal for those just starting out with its advanced visual positioning and obstacle avoidance (up to a range of 15m, even better than the P4). The Phantom 4 Professional is the new pinnacle of performance in DJI’s smaller quadcopter range. It can fly at up to 31mph with obstacle avoidance enabled, so you can benefit from high-speed shots in any direction, without worrying that you’ll crash your drone. You can also switch to ‘Sport’ mode for faster flight, but you’ll need to be very careful as there’s no sort of obstacle detection available in this setting which can reach speeds of up to 45mph. While the Phantom 4 Pro has all the modes you’ll recognise from its predecessor, there are also some new and enhanced features. ‘Narrow Sensing’ makes it possible to fly through tight environments and there’s also a ‘Draw’ mode, which lets you draw a line path on a map for the Pro to follow. ActiveTrack has also been enhanced so that it can work backwards or sideways. Likewise, TapFly lets you fly backwards now and supports ‘Free’ mode, which rotates the aircraft as it moves along its path, without changing flight direction. With a powerful 5,350mAh battery, the Phantom 4 can stay in the air for almost 30 minutes. However, bear in mind that achieving a maximum flight time depends on suitable weather conditions. There’s also the fact that the extensive range of features can also be a drain on the power supply, so keep this in mind when operation the Phantom 4. The Phantom 4 Professional runs a similar battery to the original, however, it has been slightly upgraded to 15.2V 5870 mAh, keeping the aircraft flying for up to 30 minutes. The Mavic is powered by a purpose-built Intelligent Flight Battery (3,830mAh) featuring built-in sensors and LEDs that display the status and remaining power. Despite the smaller power source, the Mavic is able to remain airborne for up to 27 minutes which rivals the Phantom 4. DJI’s Phantom 4 comes with an impressive 4K camera which enables it to achieve great ISO levels and allows for still images at 12MP quality. These stills offer vibrant colour in both RAW and JPEG formats. 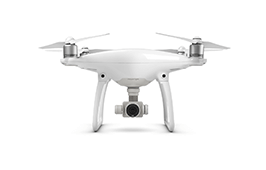 When it comes to video, the Phantom 4 offers 4096×2160 pixels at 25fps and 4K UHD at 30fps. If you don’t need the full 4K treatment, there’s also the option shoot in 2K and Full HD as well as 720p HD, the latter of which is fed to your controller in real-time. The Phantom 4 also includes two front mounted visual sensors which enable its obstacle avoidance mode and ensure that as long as it’s facing forward, you’re prevented from flying into anything that could damage the aircraft. Featuring DJI’s smallest ever stabilised 3-axis integrated gimbal and camera, the DJI Mavic Pro is capable of shooting in 4K and 12MP with Adobe DNG RAW functionality. There’s also a new ‘Gesture Mode’ which allow you to command the Mavic to take pictures with a wave of your hand and a ‘Tripod Mode’ which ensures that every manoeuvre becomes precise and slow for optimum shot quality. One thing to note is that you can expect a narrower FOV than you’ll get from the Phantom 4 but far from being a drawback, this ensures a higher level of image quality. 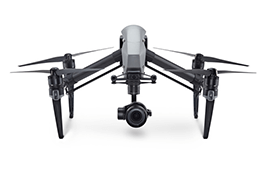 The Mavic includes additional sensors which are refined versions of the P4’s obstacle avoidance solution and the visual positioning introduced with the Inspire 1 range. Utilising these sensors, it has one of the most stable stationary hovers you’ll see from any drone on the market. Then we come to the Phantom 4 Professional. This quadcopter’s camera races past the other two in terms of quality. Images are captured at 20MP in JPG or RAW DNG, with video available up to 4K quality at 60fps. 30 and 24fps shooting rates are also available. The camera also adds aperture control and features a mechanical shutter, eliminating the rolling shutter effect you sometimes get from electrical alternatives. 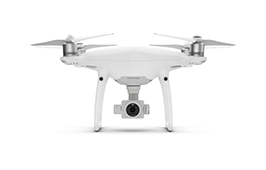 Footage is compressed at 100Mbps using H.265 compression, up from the H.264 60Mbps format offered by the Phantom 4. The new camera (and improved sensors) also allows you to access the gesture control functionality introduced with the Mavic Pro as well as a range of other features such as Draw and Advanced Return to Home. There’s also the Five-Direction Optical Sensor array which allows for front, side and back obstacle avoidance (Range: front and back- 98ft, sideways- 23ft) as well as the vision positioning sensors which detect anything below the aircraft. Keep checking back to Heliguy’s Insider blog for insights into new products and, of course, the latest news from the drone industry. It’s that time of year again, a day when prices plummet and you’re sure to find a great deal. 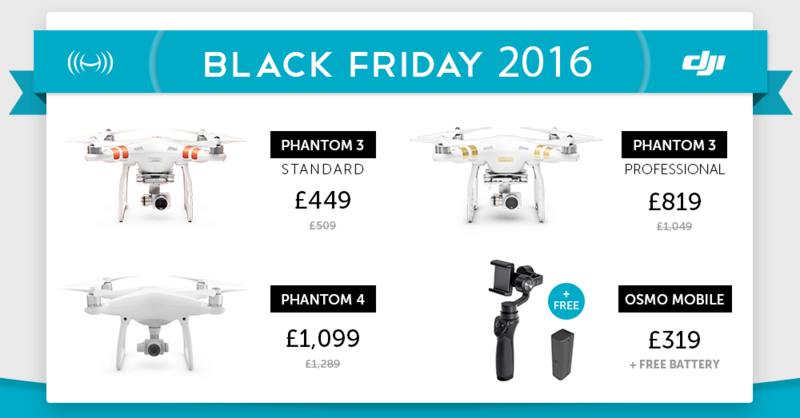 Here at Heliguy, we’re getting into the Black Friday spirit by dropping the price of a number of DJI products as well as a few other mystery deals we’ll reveal closer to the time. Take a look at what’s on offer below. The OSMO Mobile offers the stabilisation of DJI’s industry-leading handheld gimbal range, applying it to your mobile device. If you’re always taking videos with your phone, why not add a new level of professionalism with the OSMO Mobile; a shake free, easy to use gimbal from DJI. 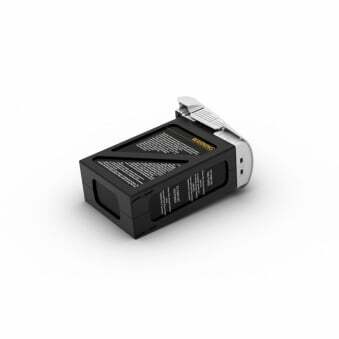 If you order during our Black Friday sale, you’ll get a FREE 980mAh OSMO battery included. A great value, robust quadcopter from DJI. The first of the Shenzhen drone manufacturer’s hugely successful Phantom 3 range – it’s a perfect aircraft for hobbyists looking to get to grips with their first drone. Offering the ability to shoot 2.7K HD video and capture 12MP stills, you’ll find plenty of uses for this classic aerial camera and, with this Black Friday deal, you really can’t go wrong. Still one of the most popular quadcopters out there, the Phantom 3 Pro allows you to shoot 4K videos at 30fps and capture quality 12MP stills. Building on the success of its predecessor, the Phantom 3 Standard, the Pro is an intuitive, ready-to-fly system that packs in some great features. 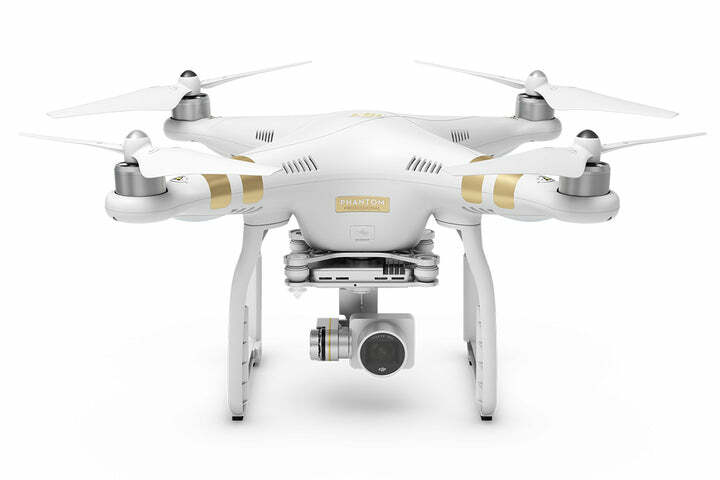 The gold standard of quadcopters used by both hobbyists and professional videographers, DJI’s Phantom 4 is the culmination of years of experience and customer feedback. Full of intelligent flight functionality and even front-facing obstacle avoidance, the Phantom 4 literally helps you fly. This isn’t to say you can’t take full control and hit some serious speeds. With the in-built ‘Sport’ mode you’re able to reach 45mph and indulge your inner drone racer. You can’t talk about the Phantom 4 without mentioning the camera, offering 4K at 30fps and Full HD 1080p at 120fps through a custom designed lens (as well as 12MP stills), you’re able to capture spectacular imagery. We’re slashing the prices in our Bargain Bin section by 20% across the board as well as implementing other surprise discounts that we’ll reveal in an email sent out to everyone signed up to an account on the Heliguy site. Don’t miss out! Keep checking back to our social media channels and watching your inboxes for more Black Friday news. 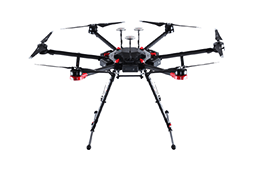 Keep checking back to Heliguy’s Insider blog for all of the latest deals on quadcopters, gimbals and aerial cameras. On Thursday, Heliguy were invited to attend DJI’s Control / Create event in London. The event was designed to give authorised dealers like ourselves and tech journalists the chance to get up close and personal with the new Inspire 2 and Phantom 4 pro quadcopters. The event was held at one of the top go-karting tracks in the UK. We guessed this is so that there was a large, open, indoor space to fly the drones as a demonstration, which turned out to be the case. 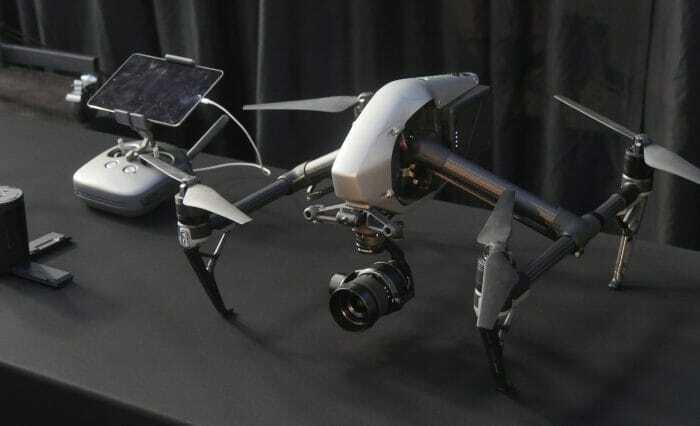 I arrived at the venue excited about the possibility of seeing the two new DJI drones in the flesh and left absolutely convinced that both platforms are a revolution, rather than an evolution, in each of their categories. Check out the footage we captured during the event showing both of these impressive quadcopters in action. The first part of the event took us through the specs and features of both the Inspire 2 and the Phantom 4 Pro in detail. 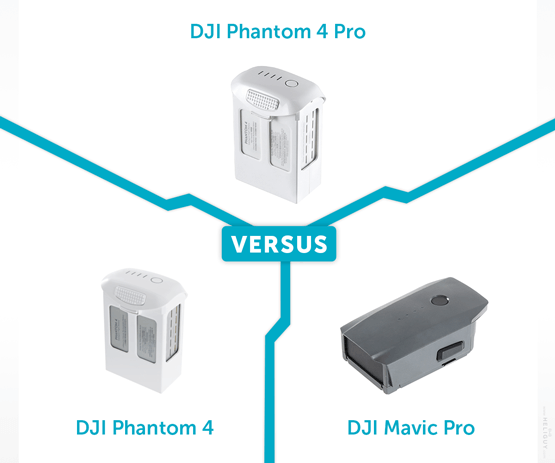 You can tell by the way the DJI employees were talking that they’ve been working incredibly hard on these products. Many of the features were created entirely based on user comments. It’s great to know that DJI is acting on the feedback users are giving them! There were several examples of stills and video clips too, which brought home just how far these new aerial cameras have come. DJI themselves were very confident in saying that the new Phantom 4 Pro camera far surpasses the X3 camera that came with the Inspire 1 when it was launched 2 years ago. The attached screen on the P4 Pro + remote was something that again, was added based on user feedback. Apparently, the new display is twice as bright as you’ll get from an iPad or iPhone, which negates the need for a hood to view the screen. Very useful when you’re out and about shooting on a bright day. The run through of the Inspire 2 specs, which I’m sure you’ve all already seen, hammered home just how powerful this craft is. The top speed of nearly 70mph is impressive while the camera technology is the best in the industry. DJI went on to say that they had challenged a Hollywood director to create a film entirely on the Inspire 2. From the snippets of feedback we got directly from the director, it seemed to be a great success. Interestingly this part of the event showed the Inspire 2 being held while filming, almost becoming a handheld gimbal. The results spoke for themselves with high-quality footage from start to finish. Then we got to see both the new drones in action. The pilot highlighted the obstacle avoidance by trying to fly both forwards and backwards into a sign – both times the Phantom 4 Pro beeped and refused to move any closer to the obstacle. Then we say the new infra-red sensors on the side of the drone in action, flying either side towards an obstacle caused the Phantom 4 pro to stop at least 10ft away from the obstacle. These new sensors will certainly help prevent even more collisions. Then we saw multiple different flight modes including spotlight, which is an active track type that followed some go karts in the demonstration. It’s incredibly stable in the air, as we’ve come to expect from almost every DJI drone. It was also very nimble in the air, helping to track the fast-moving go karts with ease. The setup was as simple as ever with DJI products and in no time at all we were airborne. Again, we saw the obstacle avoidance features in action, with the Inspire 2 easily spotting obstacles in front of it from 15ft or so. The pilot then demonstrated the vertical obstacle avoidance by taking the Inspire 2 right up to the roof of the indoor track. As expected the drone came to a halt before reaching the ceiling. DJI was keen to reinforce the fact that these features have been implemented on the back of feedback from cinematographers who film frequently indoors or in tight outdoor spaces. We then saw the impressive new TapFly mode where the pilot simply drew a path on the screen and the quadcopter followed it through the hall very accurately. The huge advantage here is that a single pilot can set a path for the drone without having to constantly control it. In turn, this frees up the operator to focus on just controlling the attached camera. 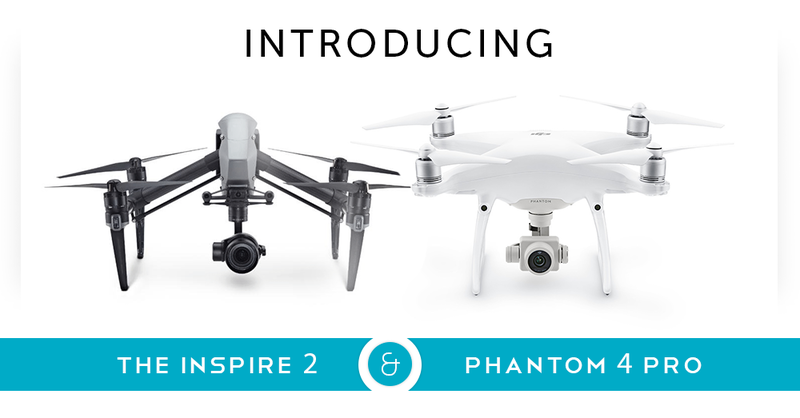 Many shots that would’ve taken 2 pilots on the inspire 1 can be captured by a single pilot with the inspire 2. 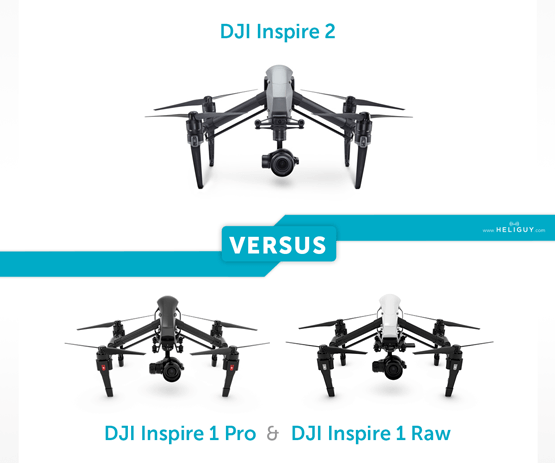 Then we saw just how fast the Inspire 2 is … in every direction. Straight line acceleration is really fast. The hall the demonstration took place in wasn’t long enough to show the top speed. It must’ve been 100m long, but the Inspire 2 sped through the hall in what seemed like an instant. Ascending and descending was also fast. All the extra power packed into this drone will be crucial in helping filmmakers capture even the most ambitious of shots without the need for lots of extra equipment. We also saw a quick example of a Slave / Master controller setup with one pilot controlling the drone and a second controller operating the attached X4S camera. All of this happened in real time. The beefed-up transmission systems were clearly helpful. There was no slowdown in video feed or drone control issues, even indoors with no GPS. The Inspire 2 really impressed. The reception from Heliguy customers has been great too. We’re really looking forward to seeing what you all end up working on with your new drones! Keep checking back to Heliguy’s Insider blog for more of the latest news from the drone industry. During their highly anticipated ‘Control / Create’ event in LA, DJI has announced the Inspire 2 / Phantom 4 Pro and Pro+ quadcopters. Here’s everything we know about these exciting new products so far. NOTE: We will continue to update this blog across the week to ensure it remains up to date and features everything you need to know about the new product including Specs, Images and Insights from our team. 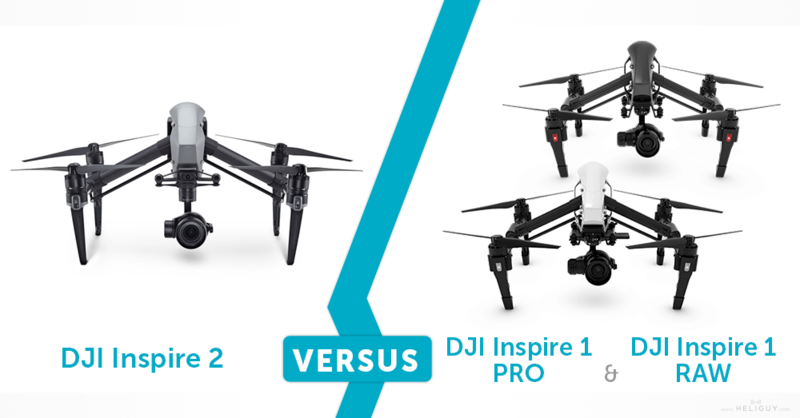 The Inspire 2 is more powerful than its predecessor. It has a new magnesium-aluminum body which increases robustness while reducing weight. It has a top speed of 67 mph, and its battery life is enough for 25 of flight time. The Inspire 2 has a self-heating dual-battery system that can keep the drone flying even in frigid temperatures and can reach 16,400ft above sea level, although, there isn’t much chance of that with current regulations. 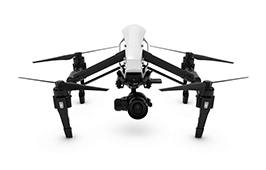 What’s most impressive though, is that the Inspire 2 is DJI’s first drone to feature two cameras. There’s the main camera for capturing footage, which is held underneath on a three-axis gimbal. The Inspire 2’s legs lift up just like the Inspire 1’s, so they won’t get in the way of your footage, and it’s free to rotate 360 degrees. 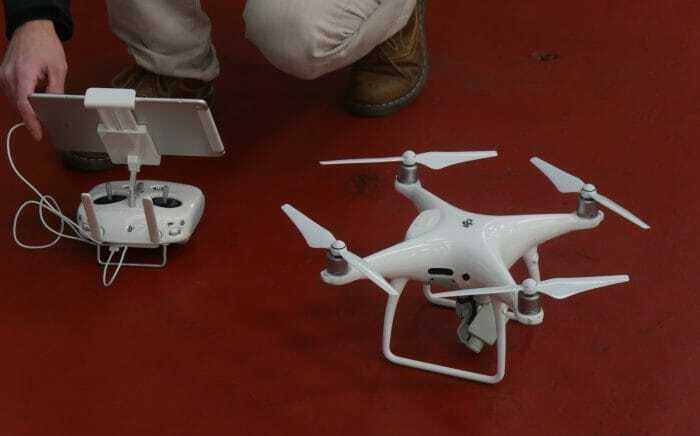 In addition, there is also a front-mounted two-axis camera, allowing the pilot to always see where the drone is facing. The system is designed for dual operators: one to fly and one to frame the action, each with their own live video feed. If you’re choosing to fly alone, the Inspire 2 helps achieve some tougher shots through computer vision and autonomous navigation. Like the Phantom 4 and Mavic Pro, the Inspire 2 now has obstacle avoidance. Vision sensors are located on the front and bottom of the aircraft, and infrared sensors are sat on top. There’s also the computer vision system and automatic subject tracking you’ll recognise from the Phantom 4 and Mavic Pro. This means you can lock onto a subject and the camera will rotate to keep them in frame. 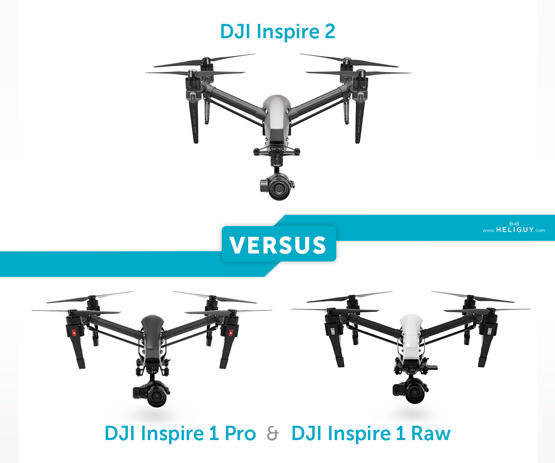 DJI has designed the Inspire 2 to satisfy professional filmmakers. They call it CineCore 2.0, and it captures 5.2K video at a 4.2Gbps bitrate. To handle all that data, the Inspire 2 has added an onboard SSD. 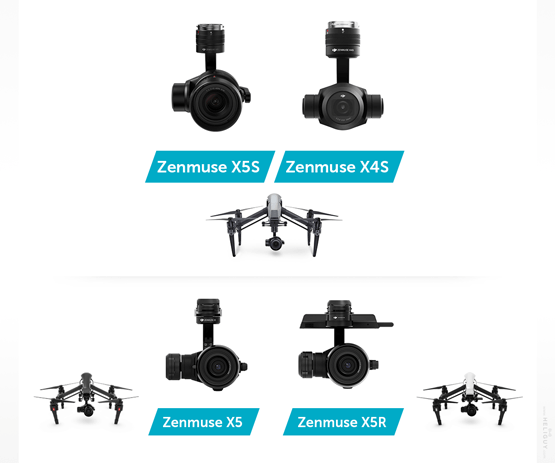 The Inspire 2 is available with the new Zenmuse X4S or X5S camera. The latter features a micro 4/3 sensor and supports 10 different lenses, including zoom. And the system supports pro video compression formats including CinemaDNG and Apple ProRes. For photographers there is also DNG RAW mode for 30MP stills. It’s also able to stream video in broadcast-quality formats which is handy for users such as news crews. It’s official, the next generation of the Phantom range is here. First off, let’s take a look at the camera specs. Stills are recorded at 20MP in JPG or Raw DNG, with video available up to 4K quality at 60fps. 30 and 24fps shooting rates are also available. The camera also adds aperture control and features a mechanical shutter, eliminating the rolling shutter effect. Footage is compressed at 100Mbps using H.265 compression, up from the H.264 60Mbps format offered by the Phantom 4. The twist-and-lock rotors are still here and the battery capacity has increased. You’ll get an extra 2 minutes of flight time from the Pro, giving you approx 30 minutes. Realistically, expect the Pro to fly for 24 or 25mins. The front obstacle avoidance sensors have been replicated on the rear, and now there are both Vision and infrared sensors on the sides. 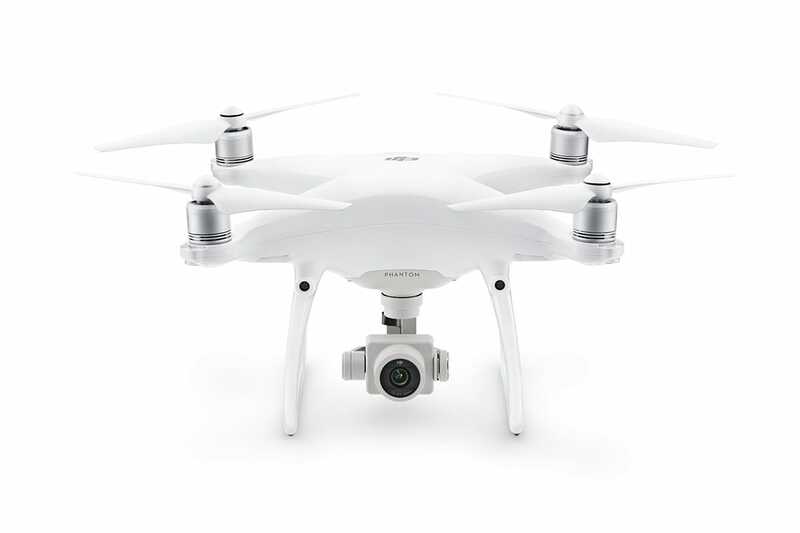 The downward-facing VPS is still included, which means that the the Phantom 4 Pro has almost 360 degrees of obstacle avoidance and enhanced positioning. Front and rear sensors can detect obstacles 98ft, and the side sensors at 23ft. The Phantom 4 Pro can fly at up to 31mph with obstacle avoidance enabled, so you can benefit from high-speed shots in any direction, without worrying that you’ll crash your drone. You can switch to Sport mode for faster flight, but you’ll need to be very careful as there’s no sort of obstacle detection available when pushing the throttle to 45mph. The standard remote control is very similar to that of the Phantom 4, with a clip to hold your smartphone or tablet. But now there’s an option for pilots who prefer not to use their mobile device. 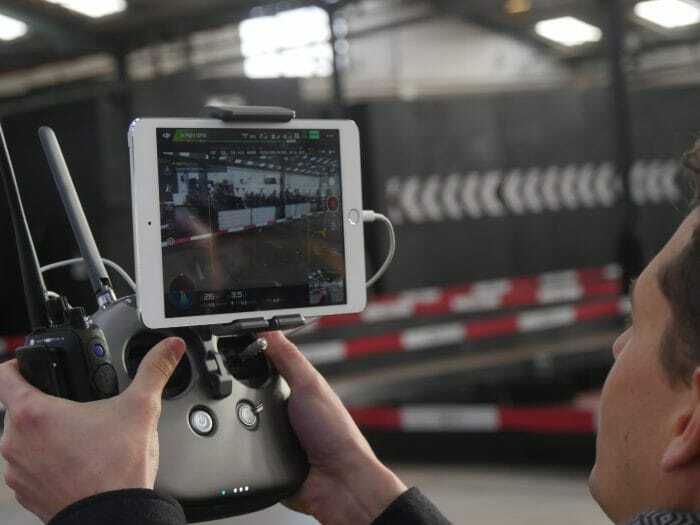 The Pro+ comes with a remote featuring an integrated tablet which has been preloaded with the DJI Go app which the company claim is suitable for use even in sunny conditions. The Pro+ remote features a microSD card slot, as well as a GPS and a mini HDMI output port for live broadcasting. While the Phantom 4 Pro has all the modes you’ll recognise from its predecessor, there are also some new and enhanced features. Narrow Sensing makes it possible to fly through tight environments and there’s also a ‘Draw’ mode, which lets you draw a line path on a map for the Pro to follow. Active Track has also been enhanced so that it can work backward or sideways. Likewise, TapFly lets you fly backwards and supports ‘Free’ mode, which rotates the aircraft as it moves along its path, without changing flight direction. See below for what we consider to be the key information from DJI’s Inspire 2 / Phantom 4 Pro product launch. 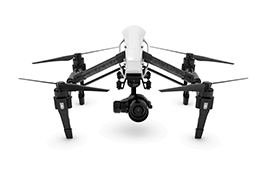 Get your DJI Inspire 2 / DJI Phantom 4 Pro from Heliguy today by following the product links below or, if you’d like to discuss these new quadcopters further, you can get in touch with us via email (info@heliguy.com) or telephone (0191 296 1024). Keep checking back to Heliguy’s Insider blog for more of the latest DJI product news and to find out what’s going on in the drone industry. 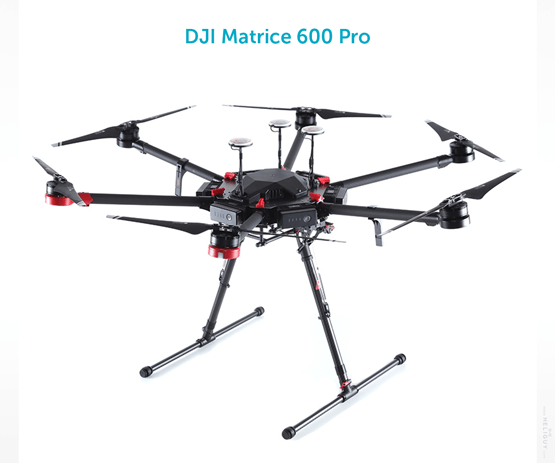 DJI have released the newest iteration of the Matrice range, the M600 Pro. Combining the power of the first generation Matrice 600 with increased portability and the fully upgraded A3 Pro Flight Controller, there’s a lot to like about this new professional heavy rig. Let’s take a look at the main differences between the two models and whether the Pro can unseat the hugely successful original model. Here’s what you can expect to be included with both versions of the Matrice 600. 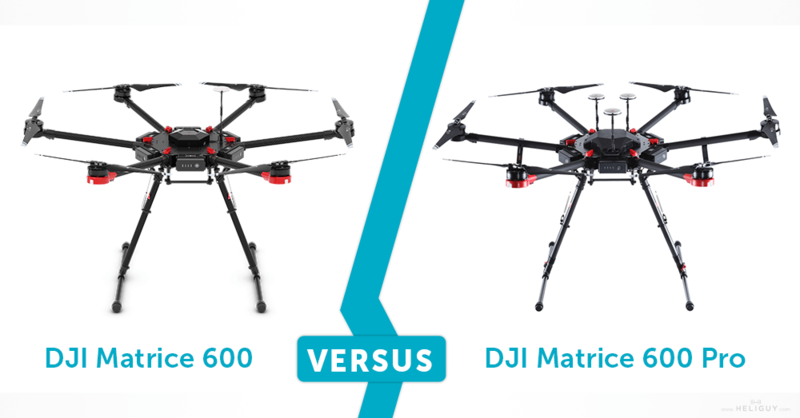 Both Matrice 600 models handle remarkably well for such large aircraft and certainly offer up a great example of DJI’s movement into the commercial market. Both the M600 and the M600 Pro are aimed at serious professionals involved with filmmaking and aerial photography, inspection work and other industrial applications. Both models take six batteries, allowing for triple redundancy and increased safety in flight. These batteries guarantee a flight time of more than 30 minutes without a payload (the original promising 35 mins and the Pro 32 mins) and around 20 minutes with a payload (both 18 mins) allowing you to remain airborne long enough to capture an impressive amount of footage or photos. The Pro has made managing these six batteries even more simple with the addition of a new charging hub allowing you to simultaneously charge your Intelligent Flight Batteries and get back in the air even quicker. DJI’s new M600 model comes with the A3 Pro as standard making it the equivalent of the fully kitted out original. Their first Matrice 600 came with the A3 flight controller with the option to upgrade to the Pro as an add-on, this gives the M600 Pro an edge over its predecessor as this system is automatically built into each aircraft. There are also a few structural changes, with the body now an irregular hexagonal shape which differentiates it from the original Matrice 600. 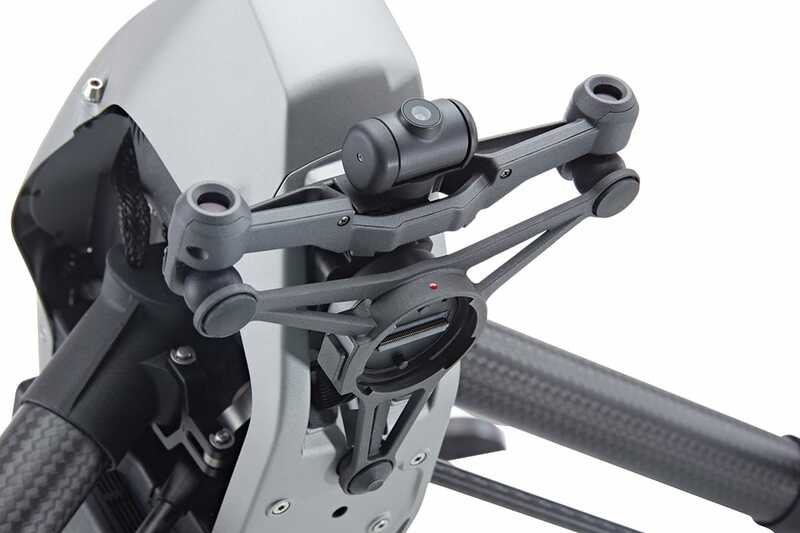 The antenna mounting position has also been shifted to one of the M600 Pro‘s arms and it offers three more CAN 1 Ports than the first generation. Then there’s the gimbal and camera compatibility. Not much separates the two models as they are both able to carry a huge range of camera suppliers including REDs, HASSELBLADs and the Zenmuse range. 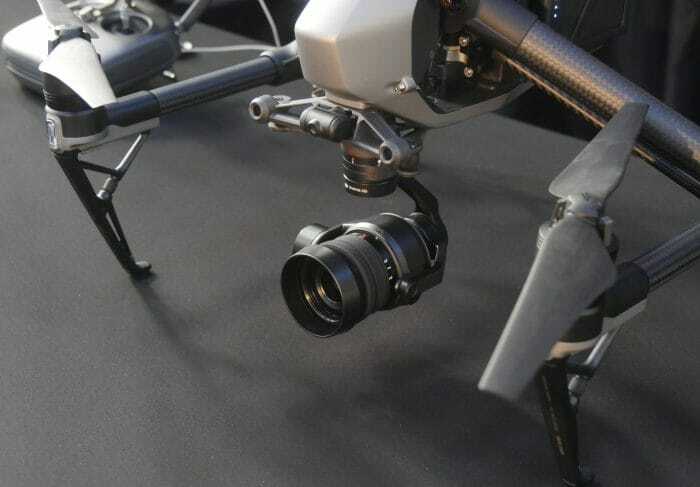 In the optional additions for the M600 Pro, we’ve noticed that there’s a specific Z30 Zoom camera gimbal, more proof of DJI’s enterprise ambitions. Once of the key selling points of the new M600 Pro is that it’s a ‘ready to fly’ (with some minimal setup) system for people on the go. 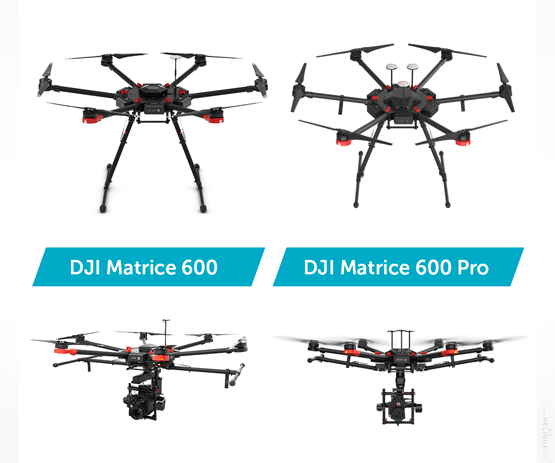 This will appeal to the key demographics DJI is angling for with the Matrice 600 range, namely professional filmmakers and companies in the business of industrial inspections. 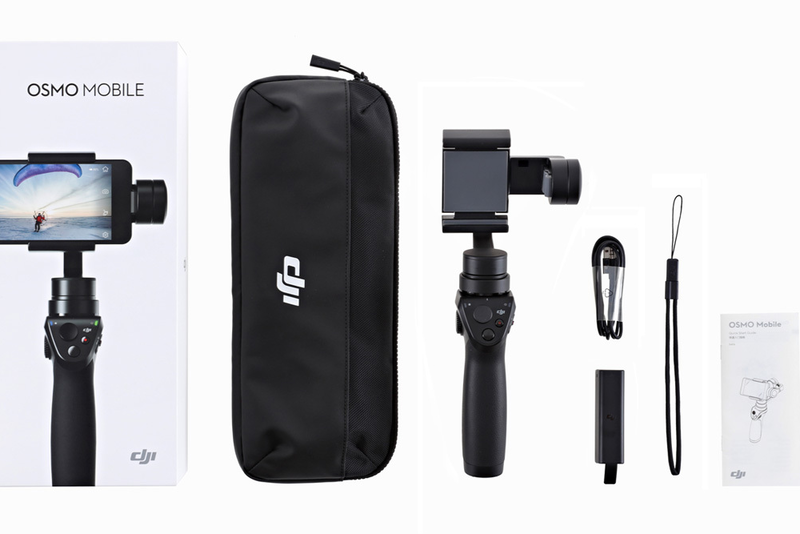 DJI’s premium heavy rig is never going to fold into your pocket like the recently released Mavic Pro quadcopter, there are certainly benefits to a new model which makes transport less of a chore. The Matrice 600 Pro certainly has the edge on the original M600 in terms of portability. The ability to fold it down to a smaller size (with a larger folding angle) and quick-release its legs offer more options for transportation which is hugely important for many involved in commercial drone operations. This isn’t to say that there aren’t solutions for transporting the first generation M600; high-quality, robust cases are available which protect the craft in transit. However, judging by the foam case included with the M600 Pro, it’s a safe bet that you’ll be able to get from A to B easier without lugging around a cumbersome carry case. This is a huge plus for those looking for a ready-to-fly, portable commercial solution. Although this isn’t a huge deal breaker, when you’re out on a shoot; a few more minutes can mean the difference between getting that perfect shot or having to start over. The difference in price can be explained by this feature alone, the M600 Pro is instantly specced up to the highest level which beats the standard Matrice 600 pack. 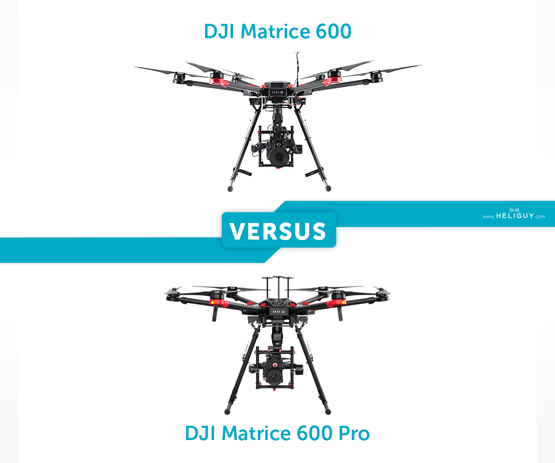 Now that we’ve pitted the Matrice 600s against each other, let’s take a closer look at DJI’s new Pro edition and what to expect. 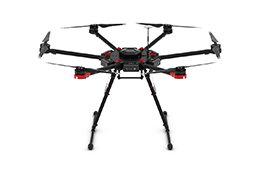 The key features of this powerful new aerial platform include pre-installed arms and antennas, modular design to make upgrades / modifications easy, improved flight time over the standard M600, the A3 pro flight controller, the Lightbridge 2 HD transmission system, support for six Intelligent Flight Batteries and an improved battery management system. The M600 Pro is compatible with the entire range of Zenmuse cameras and gimbals. It’s ideal for professional cinematographers, aerial photography and industrial applications. DJI’s new Matrice comes with an A3 Pro Flight Controller. This gives the industrial hexacopter triple redundancy along with algorithms that will help the pilot get accurate diagnostic information in real time. The dampening system means you’ll get precise control of your M600 pro while it’s in the air. The A3 Pro is also compatible with D-RTK GNSS to help reduce the impact of magnetic interference and give the pilot centimetre-level accuracy. The M600 Pro comes in a fully built state, meaning the heavy lift UAV can be in the air in a matter of minutes. A carry case is also included with the M600 pro, making transport a breeze. The airframe is easy to move from A to B and extremely light, with quick release landing gear and foldable arms. The Pro also has new GNSS module positions under the upper cover to increase reliability. // Browser vendor CSS prefixes. // Browser vendor DOM prefixes. //Change image id, title, description. The Matrice 600 Pro is designed for industrial use, for inspections, cinematography and more. The maximum payload is 6kg – meaning a Ronin-MX gimbal and a range of professional cameras will be suitable for this setup. Not only that – but the motors have an active cooling system along with a new dustproof design – meaning that you can always rely on your Matrice to battle through adverse conditions. 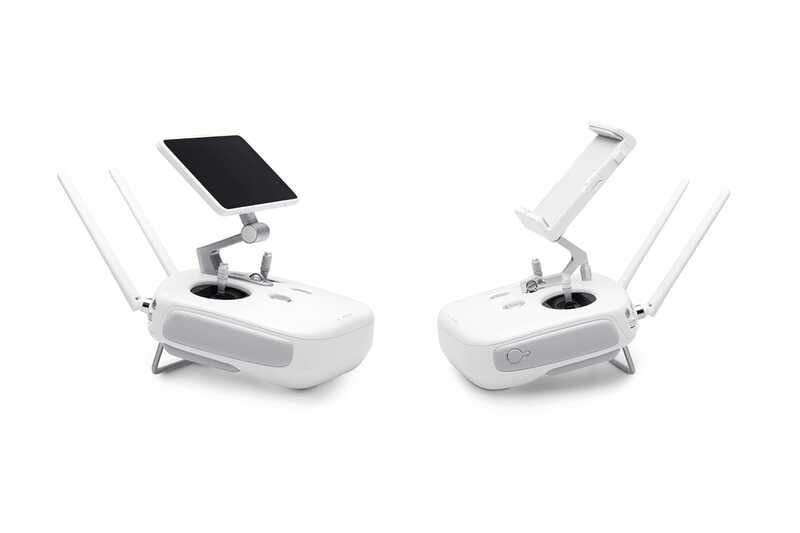 The DJI Lightbridge 2 transmission system is included with the M600 Pro. The Lightbridge 2 is designed to meet the demands of a professional broadcasting crew. The live HD feed offers a high frame rate to ensure you can always capture the perfect image. There is also support for HDMI output at 1080p/60fps. D-RTK GNSS – The dual antennas on the D-RTK GNSS allow greater levels of precision. Open SDK Development – The M600 Pro is compatible with the DJI ‘On-board SDK’ and ‘Mobile SDK’. This means that third party software can be created to tailor this UAV to specific applications. Full DJI Go and Assistant 2 Support – DJI’s GO app can be used to control the M600 Pro as you would any other DJI drone. Keep checking back to Heliguy’s Insider blog for more product comparisons and, of course, the latest news from the drone industry.